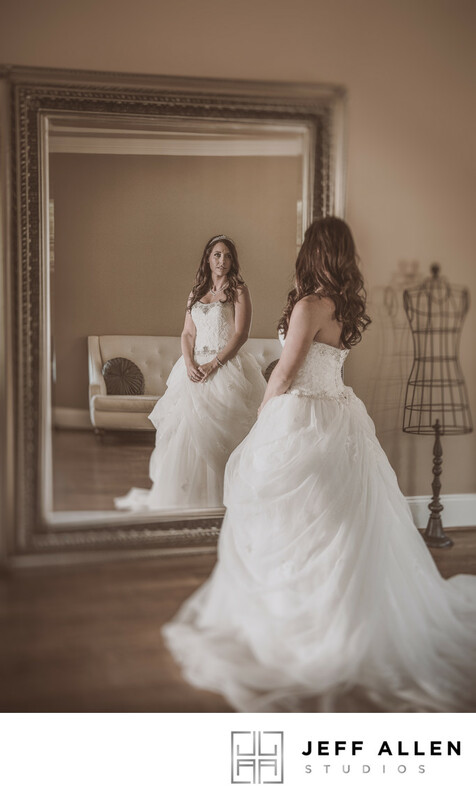 Bridal portrait sessions are a great way to give your hair and make up a test run and to make sure your dress is absolutely perfect before your wedding day. It also allows us to take the time to create something perfect without rushing between the ceremony and the reception and you have a lot more liberties of what you can do with all that free time! We were actually fortunate because on her wedding day at the Oaks at Salem in Apex, NC, we had a horrific hurricane blow through so knowing we had lots of beautiful bridal portraits already done both inside and outside was a great relief for everyone. Here I just wanted to capture that iconic image of a bride seeing herself fully dressed in from of a mirror for the first time. I had also decided to go with a very muted color pallet to not draw attention away from the bride and just allow us to share that moment and emotion with her. A little artistic blur and vignetting around the edges help draw you into the center of the image and the subject. The bride wore an Alfred Algelo dress from the Disney Collection. It was the Belle dress inspired by Beauty and the Beast and looked stunning. Location: 6304 Old Jenks Road Apex NC 27523. Keywords: ALFRED ANGELO (3), APEX (57), BELLE (3), BRIDAL PORTRAITS (3), BRIDE (6), D810 (9), DISNEY COLLECTION (3), Jeff Allen Studios (72), NC (24), Nikon (12), OAKS AT SALEM (3), REFLECTION (3), WEDDING DRESS (3), WEDDING PHOTOGRAPHY (9). 1/100; f/3.5; ISO 400; 45mm.